New York City – December 17, 2018 – Noted New York City-based soulful rock Kirtan artist Stephanie Carlin will celebrate the release of her new EP “Reclamation” with a live music yoga class plus ecstatic trance dance concert at internationally acclaimed Jivamukti Yoga Center New York on January 25, 2019. The event begins with Stephanie headlining an acoustic show during popular yogi Jessica Stickler’s weekly live music yoga class at 6:30 pm. Then, Stephanie and her band Transmorpheous celebrate that day’s EP release with an ecstatic trance dance concert at 8 pm. Presale tickets for the class/concert bundle are $35, and for the concert only it’s $25 ($40/$30 day of and at the door). A digital copy of Stephanie Carlin’s new EP “Reclamation: A Collection Of Mantras” is included in the price of entry. “We have forgotten our power. And there’s nothing more important to me than people getting how powerful they are,” shares Stephanie. The musical sage presides over a multi-dimensional platform as a speaker and singer-songwriter, kids record label founder, and life coach for artists. She’s on a mission to empower people to shed self-doubt and discover their truth. And she happens to be an expert at it. 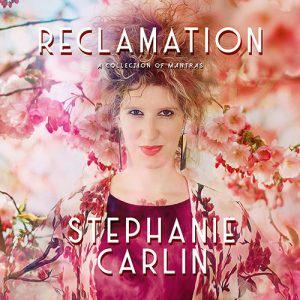 Noting, “I’m reclaiming my voice, my art and myself.” Stephanie is championing her message with a bold new EP titled “Reclamation.” The album is a stylistic mosaic infusing classic Kirtans with rock, jazz, and soul. “Reclamation” fearlessly mixes ancient Sanskrit mantras with Stephanie’s rebellious nature that defies the typical new-age genres. “I am asking the questions ‘what does it take to be happy and truly free?’” she says. The 4-song EP with the full title: “Reclamation – A Collection of Mantras” boasts an in-the-moment electricity seldom experienced with devotional music. The single out now “Lokah Samastah” simmers with touches of Afro-beat, chiming guitars, dreamy harmony, and slow-burn soulful vocals. Here, set against traditional texts, Stephanie challenges what it takes to be an enlightened spirit. Her rendition of “Hare Krishna” is like no other. Stephanie brings the otherworldly composition to street level with brawny rock guitars, and surging and passionate singing. Other tracks favor ambitious arrangements with mesmerizing ethereal touches, sweetly soulful vocals, and forays into majestic rock epic territory. Since 2012, Stephanie has fueled her music career as the founder of Free Spirits Music, an international songwriting school with thousands of students across 9 countries. Based in Brooklyn, Free Spirits Music trains artists to be leaders and emphasizes breakthroughs in self-expression and self-doubt through music. The school has blossomed to boasting sold-out semesters, presenting annual rock shows, and, in 2018, becoming a kids’ record label. As a result of her flourishing program, Stephanie was commissioned to create the curriculum for the John Lennon Real Love Project, a songwriting program for children afflicted with cancer. The program has been endorsed by Yoko Ono since 2015. Stephanie was the Associate Producer of the Annual John Lennon Tribute for 8 years, and it is the only Lennon tribute in North America endorsed by Yoko Ono. Given her valiant vulnerability, it may come as no surprise that Stephanie came up something like a punk with a mystical goth streak. She led a 10-piece band called Oliver Lankard at just 16 years old. By her senior year of high school, she had convinced her principal to give her a half-day schedule so she could catch an afternoon train from her hometown of Hampton Bays to New York City. She was commuting to record her debut EP, the Agony and Ecstasy of (2008). This is where her career truly began. Stephanie went on to release her debut LP Tree Of Series (2012) under the band name Avidya And The Kleshas. She’s garnered accolades in such venerated press outlets as MTV, The Deli Magazine, and The Southampton Press, among others. Stephanie honed her craft at Long Island University in Brooklyn where she graduated with a degree in vocal jazz performance. “Even though my shows were packed, it felt like nobody was listening. I needed so much courage to wake up every day and keep writing music,” Stephanie explains.